Oak Aphid Myzocallis Castanicola, is an insect pest that causes significant problems for both European and North American oak species. Oak Aphid Myzocallis Castanicola, is an insect pest that causes significant problems for both European and North American oak species. 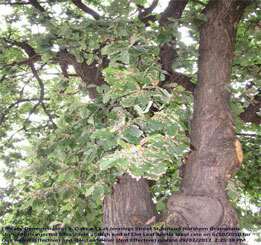 Other trees in the Fagaceae family such as European Beech are prone to infestation, Fernleaf and Copper Beech cultivars are very susceptible, Chestnuts are also affected as well. 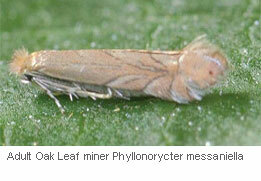 Oak aphids are small yellow elliptical insects that congregate on the leaf underside, they are also found on soft stems and young tip growth. The typical indicators to watch out for are increased European wasp and ant activity; both insects are attracted to the sugary secretion known as “Honeydew”. Another associated but secondary symptom is “Sooty Mould,” a fungus which grows on the Honeydew secretions produced by this insect. 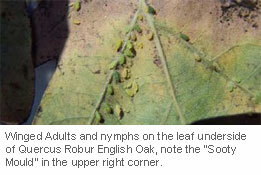 If left untreated trees will defoliate by late summer, feeding aphids cause significant damage to young leaves by piecing the leaf cuticle which contorts disfiguring the growth pattern. The excessive Honeydew excreted creates a sticky mess beneath the tree; encouraging European wasps, ants and creating potential human hazards. Care should be taken with cars and other objects of value as the excretions and sooty mould are detrimental to painted surfaces. Sooty mould is a secondary fungal problem and the indirect result of honeydew secretions; it can also be unsightly and damaging to surrounding objects such as vehicles. Other invertebrate pests that are of concern are leaf miners, mites and thrips and in some circumstances all of these pests can affect a tree at the same time. Our treatments use the newer highly systemic insecticides that target the insect orders Hemiptera, Lepidoptera, Thysanoptera and non insects such as Acaria. 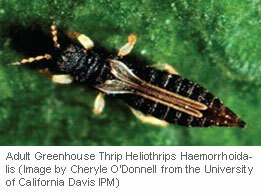 Applications of the Neonicotinyl insecticide imidacloprid i.e. 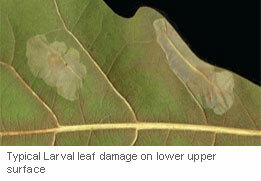 SilvaShield® or Confidor® will not control Lepidopteran insects such as Leaf Miners. Other invertebrate pests that are of concern are leaf miners, mites and thrips and in some circumstances all of these pests can affect a tree at the same time. 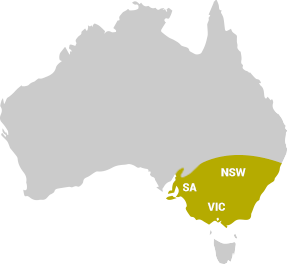 Our treatments use the newer highly systemic insecticides that target the insect orders Hemiptera, Lepidoptera, Thysanoptera and non insects such as Acaria. 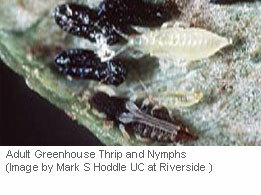 Applications of the Neonicotinyl insecticide imidacloprid will not control Lepidopteran insects such as Leaf Miners. 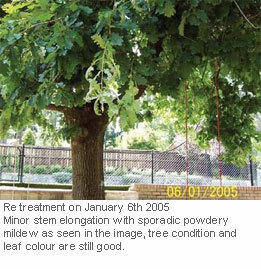 The initial symptoms of this fungal disorder appear in late spring as small brown spots which will later turn white; these smudgy white mycelial lesions are visible on the upper leaf surface. 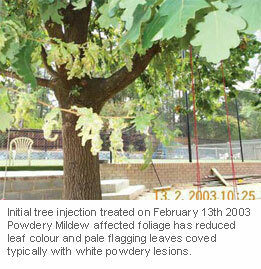 The ensuing damage can be quite significant; new leaves and shoots are disfigured resulting in partial defoliation, reduced growth, vigour and tree decline. Canopy spraying or air blasting is a good option for seasonal control; it is less damaging to the environment compared to soil injection, as very low levels of chemical penetrate into the soil profile. 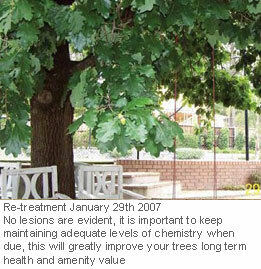 Direct tree injection is the preferred method, this uses the trees vascular system to evenly translocate chemistries to the leaf mass, treatments are effective and guaranteed for two or more years. 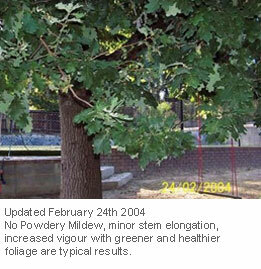 Avoid major damage and serious overall decline in your oak trees – talk to Elmsavers about the best treatment at the right time for your trees. 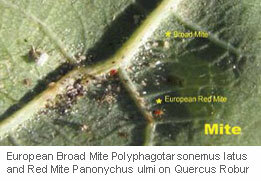 Oak Aphid and Powdery Mildew PDF factsheet (PDF, 1.09 Mb).